Quetta, Pakistan: Militant group Islamic State said on Tuesday that fighters loyal to its movement attacked a police training college in Quetta in southwest Pakistan in a raid that officials said killed 59 people and wounded more than 100. 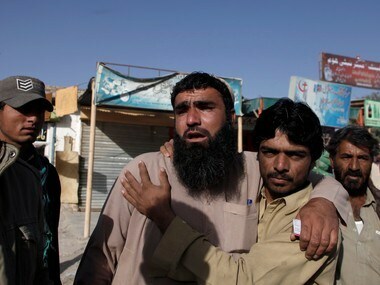 Pakistani authorities have blamed another militant group, Lashkar-e-Jhangvi (LeJ), for the late-Monday siege, though the Islamic State claim included photographs of three alleged attackers. Hundreds of trainees were stationed at the college on the city outskirts when masked gunmen stormed in. Some cadets were taken hostage during the raid, which lasted nearly five hours. Most of the dead were cadets. "They just barged in and started firing point-blank. We started screaming and running around in the barracks," one police cadet who survived told media. Other cadets spoke of jumping out of windows and cowering under beds as the attackers hunted them down. Video footage from inside one of the barracks showed blackened walls and rows of charred beds. Islamic State's Amaq news agency published the claim of responsibility, saying three IS fighters "used machine guns and grenades, then blew up their explosive vests in the crowd." 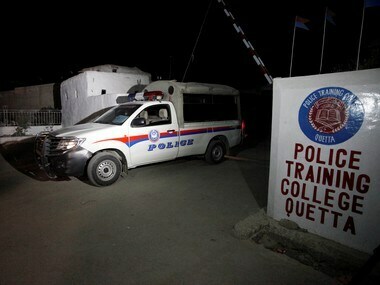 Mir Sarfaraz Bugti, home minister of the province of Baluchistan, whose capital is Quetta, said the gunmen attacked a dormitory where cadets rested and slept. "Two attackers blew themselves up, while a third was shot in the head by security men," he said. A Reuters photographer at the scene said authorities carried out the body of a teenaged boy who they said was one of the attackers and had been shot dead by security forces. Prime Minister Nawaz Sharif and Army chief General Raheel Sharif travelled to Quetta and took part in a special security meeting on Tuesday afternoon, the prime minister's office said. General Sher Afgun, a senior military commander in Baluchistan, told media that calls intercepted between the attackers and their handlers suggested they were from the LeJ, a sectarian Sunni militant group. 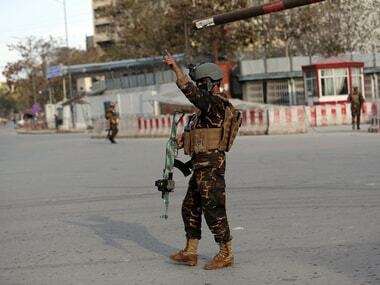 "We came to know from the communication intercepts that there were three militants who were getting instructions from Afghanistan," Afgun said, adding the Al Alami faction of LeJ was behind the attack. LeJ, whose roots are in the heartland Punjab province, has a history of carrying out sectarian attacks in Baluchistan, particularly against the minority Hazara Shias. Pakistan has previously accused LeJ of colluding with al Qaeda. Authorities launched a crackdown against LeJ last year, particularly in Punjab province. 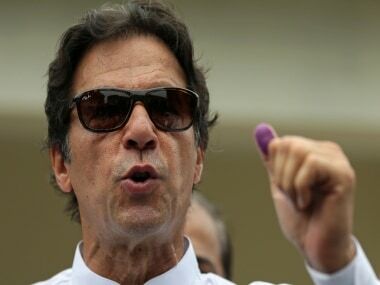 In a blow to the organisation, Malik Ishaq, the group's leader, was killed in July 2015 with 13 members of the central leadership in what police say was a failed escape attempt. 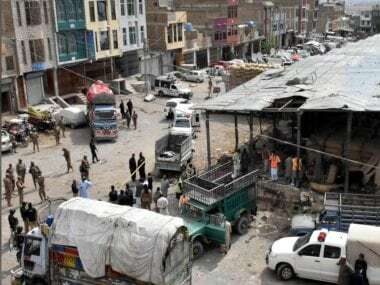 "Two, three days ago we had intelligence reports of a possible attack in Quetta city, that is why security was beefed up in Quetta, but they struck at the police training college," Sanaullah Zehri, Chief Minister of Baluchistan, told the Geo TV channel. The Hakeemullah Mehsud faction of the Pakistani Taliban also claimed responsibility for the attack in an emailed statement, but when members of the group were asked about the statement, they could not confirm it was authentic. Pakistan has improved its security situation in recent years, but Islamist groups continue to pose a threat and stage attacks in the mainly Muslim nation of 190 million. Islamic State, which established a self-proclaimed Muslim Caliphate in parts of Iraq and Syria, has sought to make inroads over the past year, hoping to exploit Pakistan's sectarian divisions. Monday night's assault on the police college was the deadliest in Pakistan since a suicide bomber killed 70 people in an attack on mourners gathered at a Quetta hospital in August. 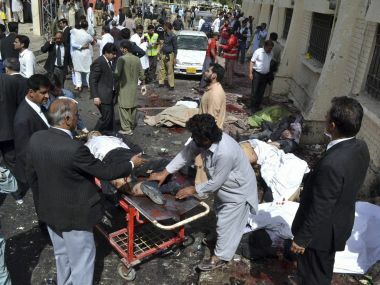 That attack was claimed by IS, and also by a Pakistani Taliban faction, Jamaat-ur-Ahrar. The military had dismissed previous IS claims of responsibility as "propaganda", and last month said it had crushed the Middle East-based group's attempt to expand in Pakistan. A photograph of the three alleged attackers released by IS showed one with a striking resemblance to the picture of a dead gunman taken by a policeman inside the college, and shared with Reuters. Analysts say Islamic State clearly has a presence in Pakistan and there is growing evidence that some local groups are working with it. 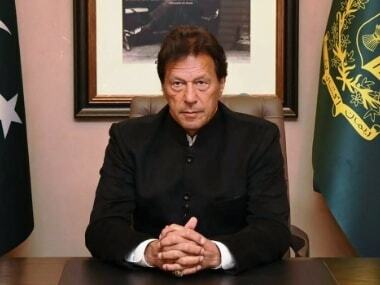 "The problem with this government is that it seems to be in a complete state of denial," said Zahid Hussain, an Islamabad-based security analyst. The White House condemned Monday's attack, and said the United States would support Pakistan in its fight against terrorism. Wounded cadets spoke of scurrying for cover after being woken by the sound of bullets. "I was asleep, my friends were there as well, and we took cover under the beds," one unidentified cadet told Geo TV. "My friends were shot, but I only received a (small) wound on my head." Another cadet said he did not have ammunition to fight back. Officials said the attackers targeted the centre's hostel, where 200-250 police recruits were resting. At least three explosions were reported at the scene by media. Quetta has long been regarded as a base for the Afghan Taliban, whose leadership has regularly held meetings there. Baluchistan is no stranger to violence, with separatist fighters launching regular attacks on security forces for nearly a decade, and the military striking back. Militants, particularly sectarian groups, have also launched a campaign of suicide bombings and assassinations of minority Shias. Attacks are becoming rarer, but security forces need to be more alert, said Interior Minister Nisar Ali Khan. "Our problem is that when an attack happens, we are alert for a week after, ten days later, until 20 days pass, (but) then it goes back to business as usual," he said. "We need to be alert all the time."